New Zealand play host to South Africa this weekend in one of the biggest games between the two sides in recent years. The two countries have produced many epic encounters in the 88 years since their first meeting and Saturday night's clash at the Waikato Stadium has the makings of another classic. Victory for South Africa would see them clinch the Tri-Nations title for only the third time ever and the first time since 2004 while success for New Zealand will ensure this year's battle for the southern hemisphere crown will go the distance - as long as they prevent the Springboks from capturing the two bonus points that will guarantee them the glory. Just two weeks ago the Springboks appeared to be coasting to the Tri-Nations title - four successive victories, including a rare victory on Australian soil, had taken them to the brink but a resurgent Wallabies side threw a spanner in the works in Brisbane last weekend to open the door for their cross-Tasman rivals. Perhaps ominously, the All Blacks now have destiny in their own hands with the last two games in this year's battle set to be played on New Zealand soil. A bonus-point victory over the Springboks and a similar result against the Wallabies in Wellington the following weekend would most-likely be enough for the All Blacks to retain the Tri-Nations and extend their winning run to five years. But it is not as straightforward as it would appear for Graham Henry's mis-firing team. Tries have been a rare commodity for the hosts of late with just four tries in their previous four games - including just two in their back-to-back defeats in South Africa. Suddenly the need to score four tries in at least one of their remaining games looks a formidable task. If they only manage it once the title could be decided on points difference with the Springboks well placed in terms of that criteria. Despite a disappointing record in New Zealand, where they have won just once in the last 10 years, their recent dominance of their old rivals means they have reason to be confident approaching their latest showdown. That one victory, a stunning 30-28 success in Dunedin, came during last year's Tri-Nations and was a psychological breakthrough for many members of this current crop of Springboks. Add a series victory over the British & Irish Lions to their Rugby World Cup crown and you begin to understand why the No.1 ranked team in the world no longer fear anyone. New Zealand were second best against South Africa in Bloemfontein, out-muscled by a bullish Springboks side fresh from taking the notable scalp of the Lions. And it was a similar story in Durban when the All Blacks' indiscipline was punished by the boot of the record-breaking Morne Steyn. A worryingly ineffective lineout and a creaking scrum added to New Zealand's woes . Henry's side have recovered a little of their composure since then with their second victory over Australia and they will have also taken hope from the way that the Wallabies opened a few cracks in the seemingly impregnable Springboks last weekend. A high-intensity and expansive approach appeared to take its toll on the Boks who were showing the signs of a gruelling fixture list well before the final whistle at the Suncorp Stadium. 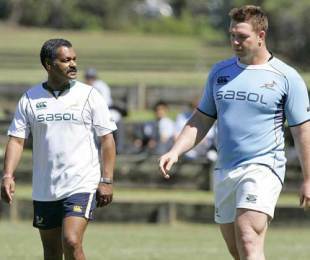 That apparent fatigue could also be the reason behind their own scrum problems although coach Peter de Villiers has laid the blame firmly at the feet of the officials. Perhaps more worrying was their charity at the breakdown - an area of the game that had previously brought them nothing but joy in 2009. New Zealand's cause has not been helped by a worrying injury list that has led to intense speculation as to the likely make-up of their backline. One thing not up for debate was the inclusion of fly-half Dan Carter who perhaps significantly was not part of the side that suffered in South Africa. Henry has resisted the urge to switch Carter to inside centre and instead Stephen Donald has been handed the No.12 shirt in the absence of the injured Luke McAlister and Conrad Smith. Donald, who has not graced inside centre at any level for six years, can expect to be targeted from the outset but he will have the reassuring presence of Ma'a Nonu alongside him having switched to outside centre to make room. Henry's faith in his squad to deliver is matched by his opposite number De Villiers who has made just one change to the side that was over-powered by Australia. Francois Steyn has been recalled at fullback in the place of Ruan Pienaar having made way himself for their victory over the Wallabies in Perth. The boot dominated proceedings in the previous matches between these two sides and with the likes of Carter, Donald, Morne Steyn and his namesake Frans on-show don't be surprised to see the ball given some air again. But as much as the All Blacks will welcome the ruthless efficiency of Carter's left foot it is his play-making prowess that is key to any try-fest. Carter has delivered many time before on the big stage and will relish this latest opportunity to shine. Only a fool would expect the Springboks to be as poor as they were last time out. They have too much experience and big-match know-how to allow a repeat but will they have enough in the tank to account for a well-rested New Zealand? The Springboks have been the best team in this year's Tri-Nations and victory would be due reward for their consistency. But sport is not always fair. The title may well come their way but they might have to wait a little while.